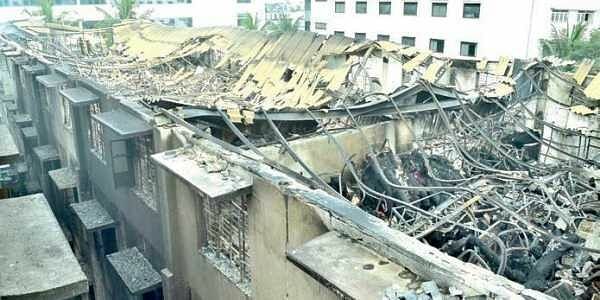 Kumaraswamy Layout police have issued a notice to the factory authorities after a massive fire broke out in a garment factory on Sunday night near Konanakunte cross. BENGALURU: Kumaraswamy Layout police have issued a notice to the factory authorities after a massive fire broke out in a garment factory on Sunday night near Konanakunte cross. The police said, Shivaprasad, the manager of the company, has registered a complaint with the Kumaraswamy Layout police. The police said that they have registered a complaint and issued a notice to the factory authorities to check whether they have fol lowed securi ty guidelines. On Sunday night, around 9.30 pm, fire broke out in Lovable Lingerie Limited’s factory located behind RMS International school, off Kanakapura road. Puttaiah, Regional Fire Officer said, “No casualties have been reported as there was nobody working inside. The security guard outside the factory noticed the fire and informed Fire and Emergency services. 22 fire engines were pressed into service and around 80 firemen fought for more than eight hours to douse the dire. The situation came under control only after six hours of the incident.” An official said, “The factory authorities said that the loss incurred is around `20 crore. Garments, machinery, cartons, furniture and other goods were totally destroyed in the incident.” “We are yet to ascertain what led to the fire. However, we suspect a short circuit might have been the reason,” he added. Garment workers who came for their usual shift were shocked to see the building totally destroyed. Some of them were worried also because they had to find a new job now.